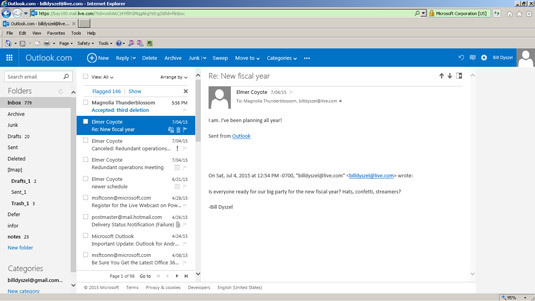 Outlook.com is a free web-based email service provided by Microsoft. It’s somewhat like Google’s Gmail service but has a twist — a link to your desktop Outlook data. Microsoft has combined Hotmail and Windows Live into one email service and has added support for contacts (including Facebook, Twitter, and LinkedIn) and your calendar. You can get an Outlook.com account by going to www.outlook.com and clicking the Sign Up Now link at the bottom of the page. You’ll need to enter the appropriate personal information, create an email address and password, and you’re done. If you have a current Hotmail or Windows Live account or a Messenger, OneDrive, Windows Phone, or Xbox LIVE account, you can log in directly. By the way, Microsoft is converting all existing Hotmail and Windows Live accounts to Outlook.com, but they won’t change your email address. You get the best of both worlds — the latest technology with an unchanged email address. The Folders list is the area along the left side of the screen that has the default Folders list of Inbox, Junk, Drafts, Sent, and Deleted. Because Outlook.com is a web application, the screens may change, but this should give you an idea of what you’ll see after you log in. 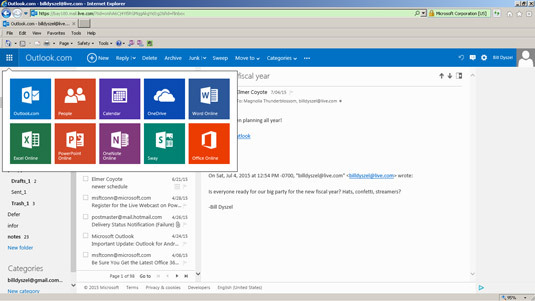 The Outlook.com screen offers toolbars and buttons to help you get around. The Ribbon in Outlook.com has many of the links you can find in the Navigation pane of the desktop version. By default, Outlook.com shows your mail Inbox, but you can get such features as People, Calendar, and OneDrive by clicking the icon to the left of Outlook.com on the Ribbon. The Outlook.com feature on the Ribbon. When you’re using Outlook.com, you won’t see many of the buttons and screens you’re familiar with from the regular version of Outlook, but most of the same features are available. Just open an email or appointment; a new set of commands will appear on the Ribbon. Do remember that because you’re still using a web browser, the menus at the top of the screen are part of the browser program, not Outlook.com. If you click a menu, you’ll get different results than you might expect. For example, if you’re reading email and choose File → New, you won’t see a New Message form; instead, you automatically open a new window in Internet Explorer or whatever browser you use.